Guerrilla Job Hunting - Would you like the opportunity to actually work with David Perry and I next week ? Would you like the opportunity to actually work with David Perry and I next week ? Tomorrow July 8th at 6 p.m. Eastern Time is the deadline to express your "genuine" interest. It’s going to be an unforgettable summer for those fortunate enough to join he and I for the upcoming 10 week Guerrilla Job Seekers Boot Camp. 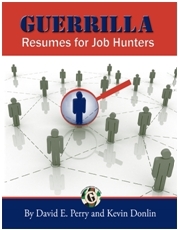 Because in this highly structured Guerrilla Job Seekers program, we are going to teach you unconventional tips, tricks and tactics that you WILL NOT find; even in the best-selling “Guerrilla Marketing for Job Hunters” series of books ! Naturally the course will include countless strategies that we NEVER blog about herein or anywhere else for that matter. Best of all---you will be getting your weekly lesson plans, our exclusive Guerrilla Job Seekers software not available to anyone who is not in our class ---at any price, you’ll be joining us for small group sessions as well as “one-on-one” time with us (both) throughout the program. Participation is LIMITED in order to give those who enroll in our program the individual attention you will not only need--- but deserve, in this unprecedented lackluster job seeker market. After some discussion, we came to the decision to extend enrollment until Friday, July 8th at 6 p.m. Eastern Time. We cannot accept any further applicants for the upcoming 10 week session after this firm date and time because Day 0 of the course is Saturday July 9th and you don’t want to fall behind ! For questions and more information you can call me (Mark Haluska) directly at my office at 724-495-2733. Should your reach my voice mail, simply leave me a message and I will return your call as quickly as possible. p.s. If after the 10 week course, and provided you perform all of your Guerrilla assignments, if you not working by then, we will stick with you FREE of charge until you are working !! !